I love muffins, but rarely do I indulge in them because I don’t know any coffee shops that carry them, and there aren’t many recipes that have satisfied me. I found this recipe online and was drawn to it because it said it was her version of the Whole Foods vegan muffin (which is currently my favourite vegan muffin that I’ve found in Vancouver, and have made a version of it once successfully). They’re hearty with the hemp seeds and nuts, sweet because of the maple syrup/chocolate, and moist because of the bananas. There’s barely any oil in them, and I’ve chosen flour that is gluten free, two things that make this muffin recipe extra great! They’re best warm right out of the oven (but really, what baked item isn’t!) and I’ve frozen the ones that haven’t disappeared within the first day. Preheat your oven to 375ºF and grease or line muffin cups (unless you are using silicone muffin cups like I did; they work best ungreased). 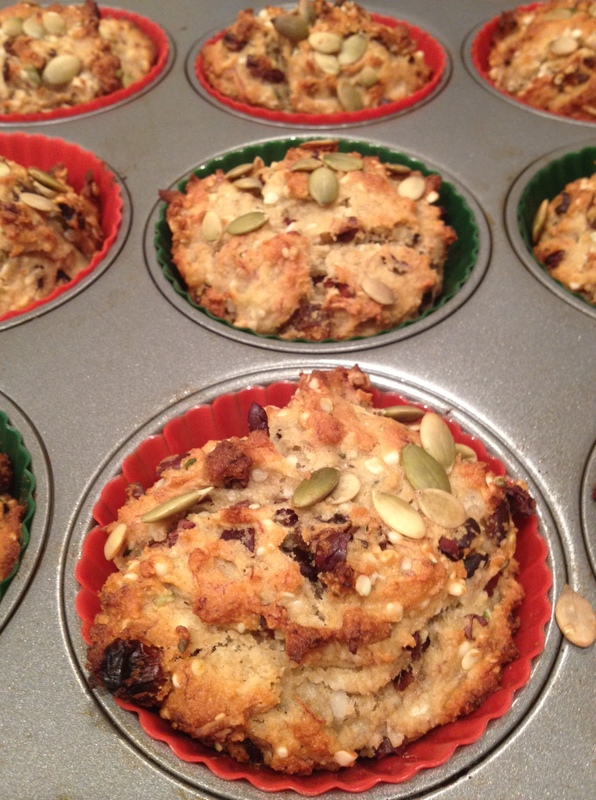 This recipe can make 12 small muffins, or 9 larger ones – your call! In a medium-sized bowl, whisk together the flours, cinnamon, baking powder, baking soda, and salt. In a mixing bowl, blend the banana, oil, maple syrup, and vanilla until relatively smooth with just some small banana lumps remaining. Stir in the hemp seeds, chocolate, coconut and nuts. Divide the batter between the muffin cups, and bake for 25 to 30 minutes, or until slightly browned on top and a toothpick inserted into the center of a muffin comes out clean. Warning: your kitchen will smell extremely good. I wait all of 2min before I eat the first one, just be careful not to burn your tongue! My challenge with muffin recipes is finding the right mixture with the wet and dry ingredients, and not having egg or egg replacer (that stuff creeps me out!). This recipe gives me good proportions to be able to invent a different muffin recipe – for example, using apple sauce instead of bananas, and changing out the chocolate chips for blueberries to create a different flavour. Can’t wait to try that next time! 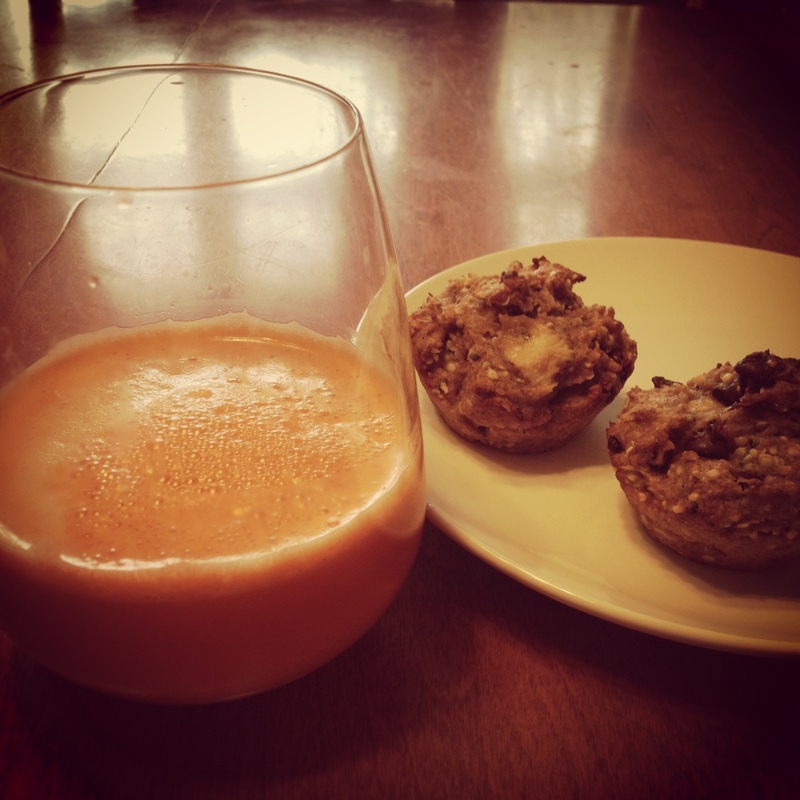 This morning, I enjoyed fresh out of the oven muffins with homemade carrot-apple-ginger juice. Soooo yummy! Now I also have muffins left over for snacks for my busy work week coming up.